WELD, ME - On Saturday, October 18th, the WS1SM team ventured to the summit of Mt. Blue, in Weld, to activate it for Summits on the Air. Along for the 1.6 mile hike were Sebastian Ames KC1BMY, Dave Wood KB1FGF, Charlie Shepard W1CPS, Bert Dumont KB1ZLV, Thom Watson W1WMG, and Tim Watson KB1HNZ.Once at the summit, they setup a VHF station atop a steel fire tower and two HF stations in the clearing below. TAUNTON, MA - WSSM members Thom Watson, W1WMG and Tim Watson KB1HNZ, attended a SKYWARN Strategy Meeting on November 1st, in Taunton, Mass. 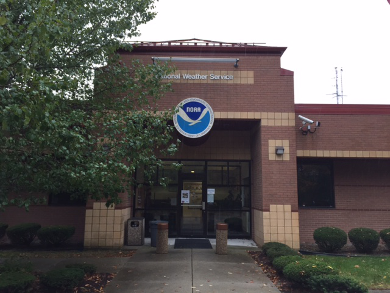 The meeting was a recap of severe weather events that effected Southern New England during 2014, and also included discussions about changes and improvements for the coming year. 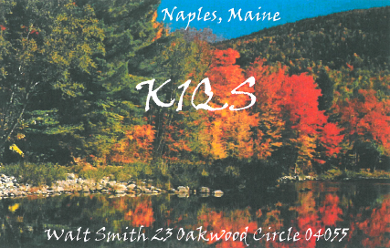 Here's a QSL card received recently by W1/YO9GJY for a 14 MHz QSO at 2256 UTC on August 3, 2014. 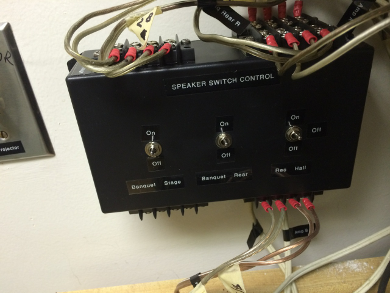 SCARBOROUGH, ME - Richard Hillock and several members of the staff at Wassamki Springs Campground were pleased with the results of the "Speaker Renovation Project" which several members of the Wireless Society of Southern Maine took part in this summer. "This is exactly what we needed," said Gerry Grenier, Activities Director for the campground. BUCHAREST, ROMANIA - The Federaţia Română de Radioamatorism celebrates 555 years since the first documented mention of Bucharest with the "Diploma Buchareşti 555." To earn the award, (which is available in four classes), its necessary to have QSO's with stations in Bucharest between September 20, 2014 - September 20, 2015. Each QSO gives one point per operating mode (CW, PH, RTTY, PSK, and other DG - one category: JT65, ROS, Olivia, Hell, etc). 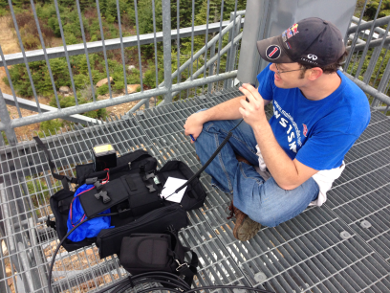 The Wireless Society of Southern Maine would like to welcome the following new members: Stuart Thomas, KB1HQS, from Portland, ME. Just as the internet touches almost every aspect of business and education, it gives us hams quick access to things like articles and technical knowledge, products, and propagation, and helps to promote events, hamfests and expeditions. 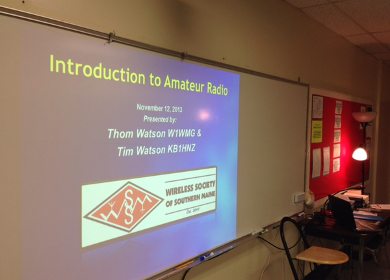 But the internet may also have the potential to undermine the integrity of amateur radio. How, you may ask? We've entered an interesting period where hybrid communications systems such as Echolink and D-STAR are shunned from any sort of participation in contesting or awards, but operating a remote HF station via internet control and VoIP is encouraged - even advertised - as a way to listen to or work that rare DX station. If they are technically the same thing, why the difference in attitude? Simple. Did I mention advertising? Here's where the lines get blurred, especially where it effects the integrity of contesting, DXCC, and Amateur Radio in general. Paul, EI5DI, wrote in an article for Echo Ireland, that "We all accept that using a net disqualifies an activity from being fly-fishing (you may still be fishing, but you're not fly-fishing), or using an engine means you can't describe your activity as sailing (you may still be boating, but you're not sailing). Why, then, does the ARRL blindly claim that using the internet in no way disqualifies an activity as being amateur radio - even if you can't 'get on the air' without it?" The ARRL and other societies argue that their support for certain forms of internet radio is merely keeping up with the times, but this adapt or die attitude just doesn't wash. Its neither founded in reality or good sense. If sailing hasn't gone away because of advances in technology represented by engines, amateur radio isn't going anywhere, so far as it still embraces its self-imposed limitations and gets on with enjoying the hobby and its challenges for its own sake. Despite the existance of regulatory bodies such as the FCC or Industry Canada, amateur radio is mostly a self regulated hobby, and the responsibility of maintaining its ethics falls squarely on our shoulders. As critical as I've been about the ARRL, there is a glimmer of hope that they may be acknowledging the possibility of ethical issues with remote control.In the ARRL Letter of August 7th, 2014, we see, under the heading of Referred to Committee, "The Programs and Services Committee is to closely examine the issue of remotely controlled stations, noting that these 'pose both opportunities and challenges.' The P&SC, it says, would "consider the possible advantages, disadvantages, and any potential ethical issues as they relate strictly to the DXCC program, and report its findings by the Board's January 2015 Annual Meeting." Granted, its a start, but no where does it ponder the possibility of other "challenges" such as virtual DXpeditions, with no operators actually located at the DX site, or that a reliance on the internet truly undermines whatever claims we have to our bands - bringing about regulatory issues. In all competitive activities, including contesting and DXCC award chasing, how things are done matters, and the ends don't always justify the means.